The front profile of the banjo neck “roughed out”. The front profile of the neck represents the available space for playing. It is a good idea to use a pattern or another banjo as a template for this part of the design because the front profile of the banjo neck is an irregular shape. There are two ways to think of the front profile of the banjo neck. It could be thought of as a four string neck with a fifth string bump out beginning part of the way down, or it could be thought of as being a five string neck all the way up to the nut with the fifth string area cut away above the fifth fret. Why does it matter? Because the placement of a center line changes with each perception. Use a center line for laying out and thinking of shapes, even in the case of asymmetric shapes. It helps with lining things up. So where is the center line on a 5 string banjo fingerboard? Well, the Mac solution is to measure half the width of the fingerboard at the nut end of the neck and half the width of the fingerboard at the rim end of the neck and draw a straight line connecting the two. This line should closely follow the center line of a laminated neck blank. The neck blank with peghead overlay and fingerboard attached. The cradle assists in holding the neck while band sawing. The front profile of the neck begins to take shape. 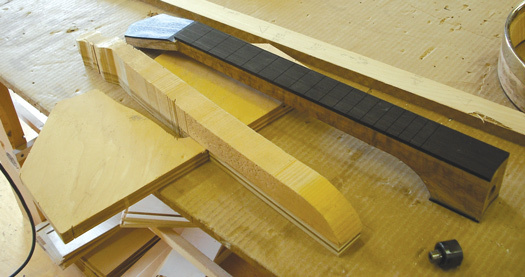 The cradle helps to cut the sides of the peghead so that all the contour lines (including the ones on the sides of the peghead) are ninety degrees to the plane of the fingerboard. After both the peghead and front profile of the neck are laid out it is time to visit the band saw. Mac uses a “cradle” to hold the neck with the fingerboard facing up and sitting level. 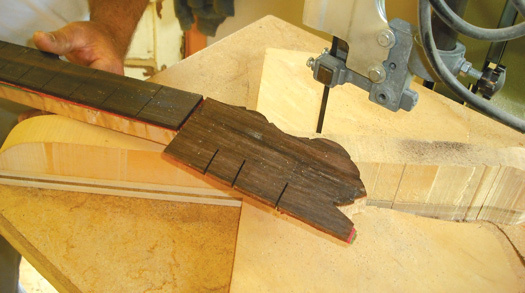 This helps cut the peghead so that the contour lines of its sides are ninety degrees perpendicular to the plane of the fingerboard rather than the plane of the peghead, a small detail reminiscent of many golden era banjos. The cradle also makes the job easier and safer. After band sawing, the fingerboard pattern or template is fixed to the fingerboard with double-sided tape or small screws. The neck is put in the vice and the template is routed around to clean up all the rough stuff left over by the bandsaw. I have often worked off the rough edges from the bandsaw by hand with a rasp, working to a line that marks out the shape of the neck.